I'm out of soap. By that I mean bath soap. Yesterday I went to the store specifically to get soap. I came home with butter and some orange juice. Yes, I had a list in my pocket. I completely forgot to look at it. Thursday I went to the store looking for soap. I came home with milk and some ground beef, I also got a great deal on stale doughnuts. They say three times is the charm. 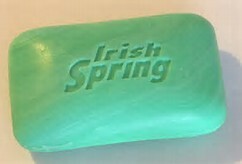 Today I will once again go to the store in search of soap. Stay tuned.